Career Highlight: Recently our firm won the highest jury verdict in the state for our client. Future Professional Goal: Keep doing what I love and loving what I do. Paralegal Practice Tip: Never forget that behind every case file is a REAL person. Favorite Way to Deal with Work-Related Stress: I paint and listen to music to relax. Favorite Social Media Site: Facebook, because it’s a nice social outlet after a long, difficult day. 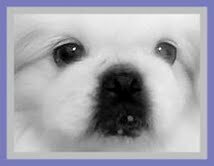 Cat or Dog Person: Both…but my white pekingese Buddy is da bomb. Gen is right, Buddykins IS da bomb! Recipe Your Family Begs You to Cook: My family begs me NOT to cook; my husband is the chef extraordinaire at our house. One Gadget You Can’t Live Without: It’s not a gadget…but it’s a must in my office: a diet Coke. One cold diet soda later, and it’s all good. Paralegal/Legal Memberships: I don’t have any 🙁 Perhaps you can suggest one? Many thanks to Gen for surprising me with her completed profile questionnaire, which she prefaced with, “I’m not nearly cosmopolitan enough [for your blog] but I would love the chance to win a mug…” She made me laugh, because as you all know, I am a small-town gal and pretty much the opposite of cosmopolitan. I’ve also enjoyed Gen’s comments at Practical Paralegalism’s Facebook page. I suggested that she see if there is an active NALA, NFPA or NALS chapter within driving distance, and that county and state bar associations with paralegal divisions are also excellent groups. I told Gen I’d ask my Kentucky readers for recommendations for paralegal associations in her area. Can any of my Kentucky readers help Gen out? Thanks in advance!